It’s already looking ominous. It took Magnus Carlsen five games to take the lead in Chennai, but he’s already the front-runner in Sochi after a display of finesse and power that had Vishy Anand on the rack long before he blundered all his hopes away in a single move. The only comfort, perhaps, is that the Indian former World Champion still has no less than ten games remaining to put things right. That recalled fellow Carlsen second Jon Ludvig Hammer’s tweet during Game 4 in Chennai, which somewhat backfired! For a while it seemed the story might be repeated in Game 2 in Sochi, since just when things were looking hopeless Anand rustled up the kind of counterplay that was always his speciality. But we’re on an accelerated timetable in Sochi, and it just wasn’t to be. 1. e4 e5 2. ♘f3 ♘c6 3. ♗b5 ♘f6 Anand is happy to play the Berlin - but with Black! 4. d3 Carlsen has no great desire to play the ending with White. 4... ♗c5 5. O-O d6 6. ♖e1 Curiously this move is almost a novelty. More common are c3 or Nbd2. 7... bxc6 8. h3 ♖e8 9. ♘bd2 ♘d7 There were many possible options - Anand's idea is to play the manoeuvre Nf8-e6. 9... h6 10. ♘c4 ♗e6 seems somewhat preferable to me. 10. ♘c4 The knight feels very comfortable here since there's no bishop on e6. 10... ♘f8 since White can already respond with 11. ♗d2! ♘e6 12. b4 ♗b6 13. a4 and the bishop is in trouble. 11. a4 a5 12. ♘xb6⁉ A surprising and very interesting move! Carlsen alters the pawn structure so he can immediately strike against it. 12... ♘xb6 would leave the a5-pawn weak for life - White would have no trouble ganging up against it. 13. d4 Perhaps the critical moment in the game. I was wondering about this move. It looks a bit weird but I was very attracted to the idea because I felt Black can try and solve all his problems straightaway without waiting for White to find some kind of a setup to cause problems. I think Black is fully prepared to start counterplay connected with f5. Also the structure on the queenside is such that although optically the pawn on b6 could be termed a backward pawn which might become weak, White needs a lot of time before he can even try attacking it. 14. ♖a3! 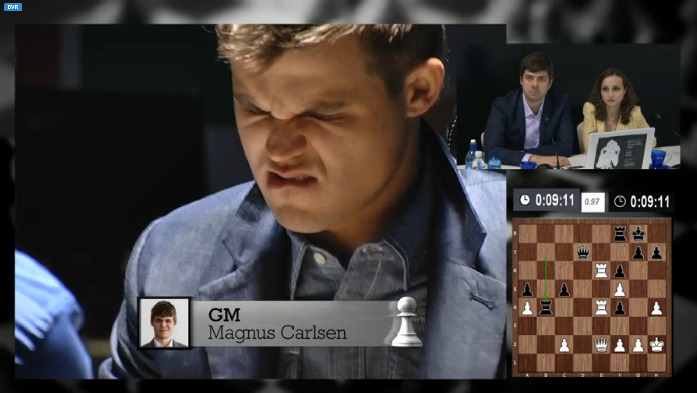 There's no mistaking Carlsen's aggressive intentions in this game. 14... ♘f8 Anand has no way to combat the white plan so he sets up his pieces as best he can in order to reduce the consequences. One of the keys to the enormous strength of Carlsen is how he manages to pose serious problems to his opponent without, apparently, doing anything spectacular. It seems simple! 15. dxe5 Clarifying the structure in order to be able to attack more easily on the kingside. 15... dxe5 16. ♘h4 Heading for f5. 16... ♖d8 17. ♕h5 Black can now swap around the order of his moves, but he doesn't have many piece configuarations he can choose between. 20. ♗h6⁉ gxh6 21. ♖xg6+ hxg6 22. ♕xg6+ ♔f8 23. ♕xf6+ ♕f7 (23... ♗f7 would be met by 24. f4 and the e-pawn (or the f-pawn become an e-pawn) would deliver the final blow.) 24. ♕xh6+ ♔e8 25. ♕h8+ ♕f8 26. ♕xe5 with a very entertaining but unnecessary position. 20... ♗xf5 Anand aleviates the pressure by accepting a strategically inferior position - but one without any mates on the horizon! 20... ♖d7 would be met by 21. ♗h6 since after 21... gxh6 22. ♕xh6 the h-pawn enters the fray. 20... ♔h8 is the inhuman move suggested by the engines after "thinking" a while! 21. ♖xg6 (21. ♕f3 , followed by h5, would be the less concrete but equally dangerous option. h5 is about to come!) 21... ♕f7 Black's idea - but not an easy one to come up with! b) 22. ♖h6 gxh6 23. ♕xf7 ♗xf7 24. ♗xh6 White has a pawn for the exchange with f6 liable to fall, and I think this ending is easier to play for him - nevertheless, this is a much better option for Black than the one in the game! 21. exf5 ♘f4 22. ♗xf4 exf4 23. ♖c3 All the white pieces are better than their black counterparts and f4 is also weak. The conversion certainly isn't easy, however, since the d-file can provide counterplay at an opportune moment. 23... c5 24. ♖e6 ♖ab8 Overprotecting b6 in order to be able to activate the queen. 24... h6 may have been a better option. 25. ♖a3 , with the idea of Ra1-e1, is the machine's suggestion to prevent a piece coming to d1. Too creative, wouldn't you say? 25... ♕d7 26. ♔h2 Preventing an exchange of queens on d1. 26... ♖e8 , trying to exchange rooks, does little to help, since after 27. ♖ce4 ♖xe6 28. fxe6 the pawn is a real headache for Black. 27. ♖ce4 ♖b7 The white advantage is very big, but it's still not so easy to convert. 28. ♕f3 to at some point capture the pawn on f4. 28... b5 Looking for counterplay! 29. b3 bxa4 30. bxa4 Carlsen doesn't want to deviate from his goal - entering on the seventh rank - even if it means damaging his pawn structure. Anand seeks counterplay along the newly-opened avenue. It's only afterwards it looks easy! 31. ♖e7 ♕d6 32. ♕f3 Carlsen's only mistake in the whole game? How difficult it is to play against someone who almost permanently comes that close to perfection! Perhaps a task for the next generation? 32. f3 would have given Black fewer options. 34... ♕d2 35. ♕xf3 ♕xc2 Black is still alive and kicking. 36. ♔g2 Defending f2 in order to free up the queen, which forces 36... ♔h8 with the idea of defending g7 in the most ugly manner possible with Rg8. Although the black position is very passive at least it's not losing in any concrete manner and there would have been a lot of work ahead before Magnus could notch up the point. Afterwards there was no mistaking the balance of power. If you mean play a better game than today, then certainly yes. It’s a pity as I almost got back into the game, but what can you do – you have to go to the next game. In general if I feel that my position is better I will play on against any opponent, of any age, with any colour. 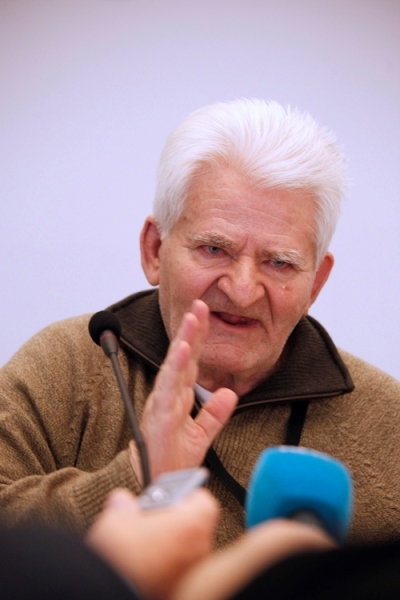 I saw there was an older man with white hair, but I didn’t know that it was him... I think he would have liked the game. I don’t know if you asked him? He was probably the most universal player of his time. In his prime he could play successfully in any type of position and it all came very naturally to him. No, I’ve played mostly for myself throughout my career, but if he thinks so then good for him. Magnus was very happy with his gift to himself! 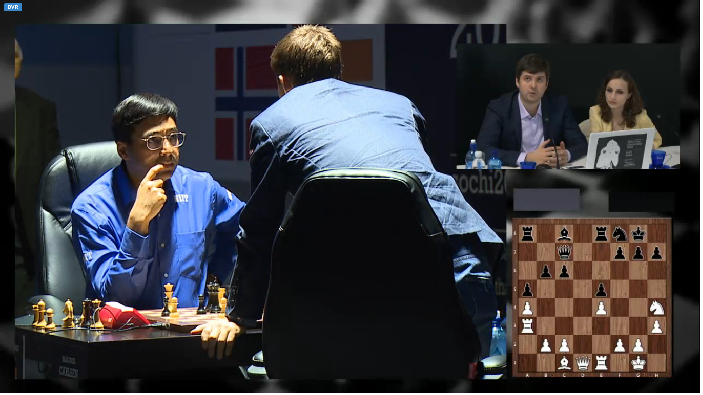 So Vishy is already playing catch-up, and will be looking to hit back with the white pieces in Game 3. The action resumes at 13:00 CET on Tuesday 11 November.